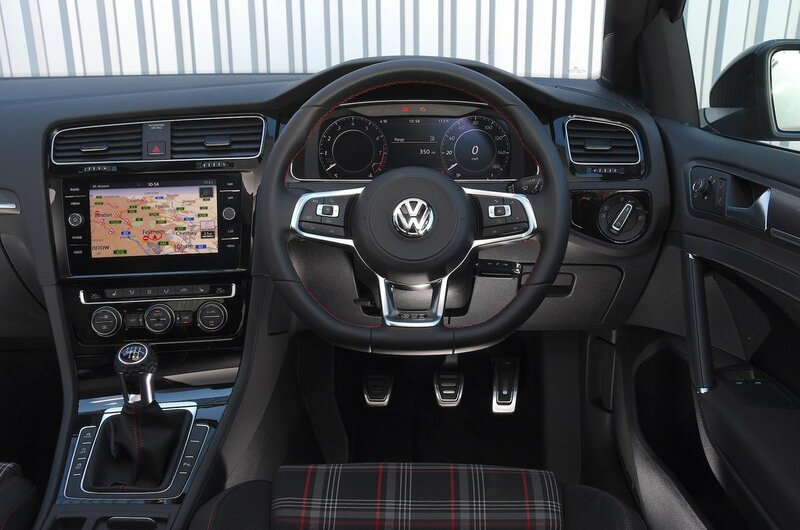 Volkswagen Golf GTI Interior, Sat Nav, Dashboard | What Car? 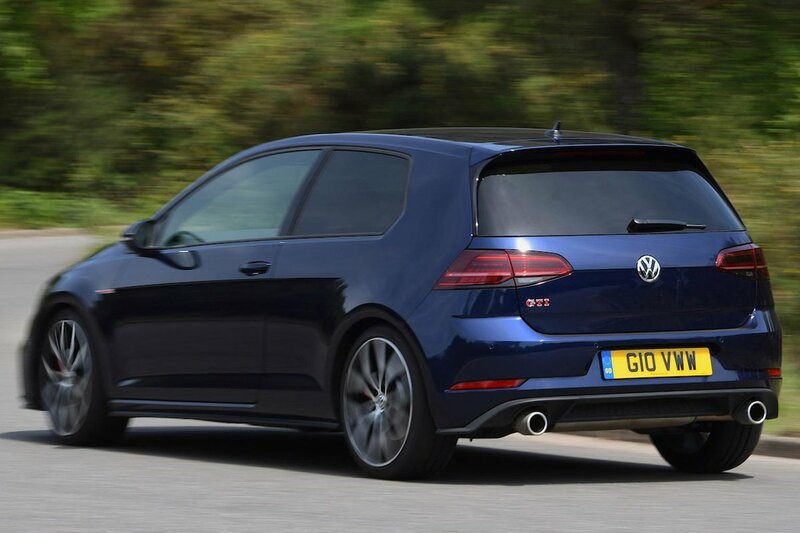 The GTI models are no different in dimension or design to any other Golf, and that helps it to be one of the best hot hatches for drivers to sit in. There’s plenty of height and reach adjustment to the steering wheel, and its driver’s seat can be adjusted for height and for lumbar support. Combined with pedals that line up neatly with the driver’s seat and steering wheel, drivers of all shapes and sizes should be able to get comfortable easily enough. The standard 12.3in instrument panel contains digitalised instruments and can show extra information, such as the satellite-navigation maps, while the rest of the major controls are thoughtfully arranged, too. 'Easy to operate' is a description well-suited to the 8.0in touchscreen infotainment system. Flanking its screen, you'll find touch-sensitive shortcut buttons for switching between the main function menus, plus two rotary switches – one for volume, the other for scrolling through lists or zooming in and out of maps if you don’t want to do this via the touchscreen. You get Apple Carplay, Android Auto for mirroring your smartphone to the screen, and a DAB radio and Bluetooth as standard. It’s quite easy to fathom the logical menus, so pairing your phone or finding your favourite radio station is an easy task without resorting to the owner’s manual. An upgraded system with a bigger 9.2in screen and more features is an option, but we’d save the money. In fact, the infotainment system and dashboard layout at large are better to use than that of the most of its rivals, especially the Honda Civic Type R, which has a terrible infotainment system – and the Renault Megane RS's isn't much better. The Golf is also better finished inside than many of its rivals, with smart-looking and mostly plush-feeling materials used throughout. 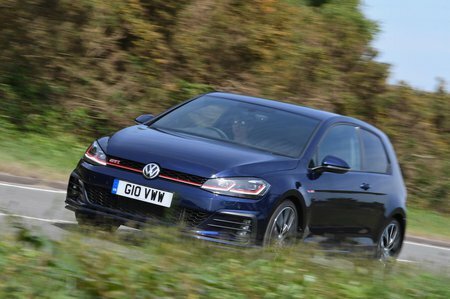 The Golf’s boxy design also helps with visibility: its large windows and relatively slim windscreen pillars make it easy to see straight ahead and to the side. The rear pillars are fairly chunky, but since all GTIs get front and rear parking sensors as standard, you shouldn’t find slotting into a tight parking space overly stressful.